Kim Jong Un isn’t really in a position to be handing out style advice, especially when it comes to hair, but that hasn’t stopped him trying. As part of the controlling regime in North Korea, the dictator has approved 14 haircuts for men and 15 for women. Kim’s own questionable hairdo was exempt from the list, proving that even he is aware of how offensive his haircut is. Finnish journalist Mika Makelainen took photos of the two posters which he claims show the haircuts which are approved. Apparently hair dying is completely off the cards, and the women’s ones all look incredibly similar. 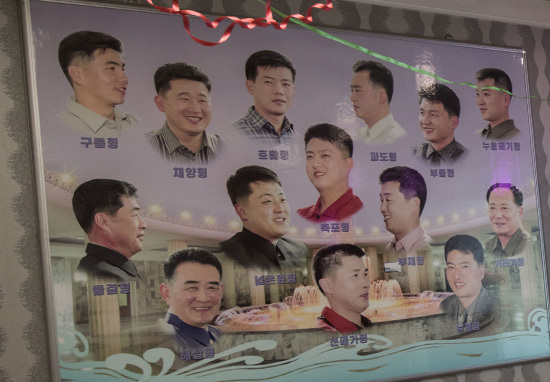 North Korean men can choose between 15 approved haircut styles. I had the most popular one – and it’s not like Kim Jong Un. Although it’s worth pointing out that we could only count 14 in the men’s section… Maybe Kim himself is the life model for number 15 as, two years ago, he was ordering men to emulate his unique cut, limiting hair growth to a maximum of 2cm. I’m not sure how having a nation of mundane hairdos is aiding his regime, but it’s good to see the North Korean leader keeping trim in at least one way. Equality in North Korea: Both sexes have 15 approved haircut models. You can forget about dyeing your hair though.